We believe in client partnership throughout the executive coaching process. We guide clients through the planning, lead the development effort, and help create the environment to ensure growth and success – short term & well into the future. Each client is unique, therefore each executive coaching project is customized to the organization’s need as well as to the individual leaders being developed. We begin after receiving an invitation for an introductory visit or phone call. We learn what type of coaching a client is looking for, explore the need for an executive coach, determine the scope of work, and discuss what outcomes clients expect to achieve. At this stage, we are introduced to the individuals being offered executive coaching. In conjunction with the organization, we present information and respond to questions. The individual is then given the choice to participate in executive coaching. After the coaching client has had the opportunity to meet one or more coaches, they will have the final say for which coach offers the best fit. Once selected, service agreements are finalized with our sponsoring organization. 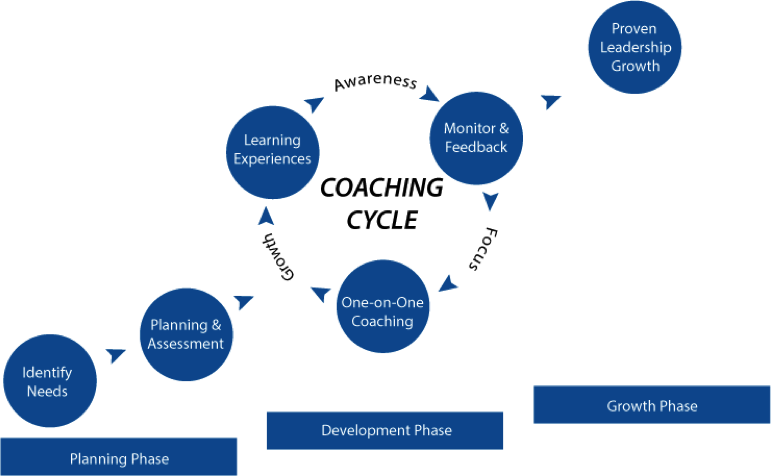 The coaching process begins with three primary areas of discovery: assessment, interviews and documentation. Relevant information from key stakeholders and the company helps our client prioritize their development needs and opportunities. The end result of the discovery process will clarify the need and priorities for coaching, along with approvals from the leader’s executive sponsor. Using the company or our plan templates, we clearly define goal statements, action plans and relevant measures to confirm progress. We leverage one-on-one coaching meetings to customize the design needed to grow the leadership and management skills of our clients. To be effective, we have learned that coaching must be owned by the executive, must be future focused and must take advantage of job experiences. Before we exit the coaching process, we acknowledge the gains made. Together with the sponsor, we identify a roadmap to not only anchor the gains, but also continue the path of proven leadership growth. Successful coaching engagements are giving the client what they want and need, but delivering beyond their expectations. It’s about building a process that our client can continue to utilize throughout their career, again and again. Finally, let’s not forget the while the executive being coached is our client, the organization is the sponsor and is providing the resources to pay for the coaching. Given that, we share progress at periodic check-ins, build alignment for the developmental plan, and build shared commitment for the effort and outcomes.